Dear friends, we’ve finally arrived at something "Fairytale Weddings" can’t do for you: put into words the magic of getting married in Verona. However, we promise you that we’ll do our best to find the appropriate words to make you understand the unique excitement of getting married in the City of Love. You should know that wherever you are in Verona you breathe in “Love with a capital ‘L’”. This is thanks to the story of the two most famous young lovers in history, made immortal by the English playwright Shakespeare in his tragic drama Romeo and Juliet. The essence of their imaginary passage through the city and the places described in the play has left an indelible mark that can be seen in every street of the old quarter of the city. "Fairytale Weddings" will make it possible for you to fulfill your dream of love in the city of Verona, in the same places made famous by the story, with either a civil wedding, a symbolic ceremony, a blessing, an engagement or a promise of love in Juliet’s house, on the balcony made famous by the first dialog in Shakespeare’s Romeo and Juliet. If your choice is oriented toward a civil or symbolic ceremony, "Fairytale Weddings" will be pleased to offer you other marvelous ancient villas and palaces in which to make your dream come true. For a religious ceremony you can choose to get married in a beautiful Romanesque church, a small parish church or a rural chapel with a baptistery attached. In choosing the locations for the reception, we will ask you to close your eyes and just imagine where you want to make your love dream come true. Are you in the frescoed hall of a historic palace while you celebrate with your guests? Or has your imagination led you to explore the vineyards and olive groves around one of the beautiful Venetian villas, ranging from the Renaissance to the Neoclassical style? Or are you visualizing yourself and your guests in the warm and informal atmosphere of a charming period farmhouse? Or is that you flying at sunset over the hills surrounding the city, with Verona at your feet? Maybe you and your guests are marveling at the changing shades of Lake Garda as the sun slowly sinks behind the mountains? Or are you on the picturesque terrace of a charming hotel overlooking the rooftops of the city while you and your guests sip on aperitifs? Verona is the fourth most important Italian city of art, as well as being picturesque, romantic, and rich in history and traditions. The province of Verona stretches as far as Lake Garda to the west and the mountains to the north, and in recent years there have been growing numbers of high-class tourists in search of elegance and luxury. Thanks to this trend, the hospitality and retail sectors in Verona and its surrounding area have greatly improved their standards of quality, so they can now satisfy even the most demanding of customers. Today you can find famous luxury brand stores alongside historical local shops selling the best produce of our territory. Why Get Married in Verona? 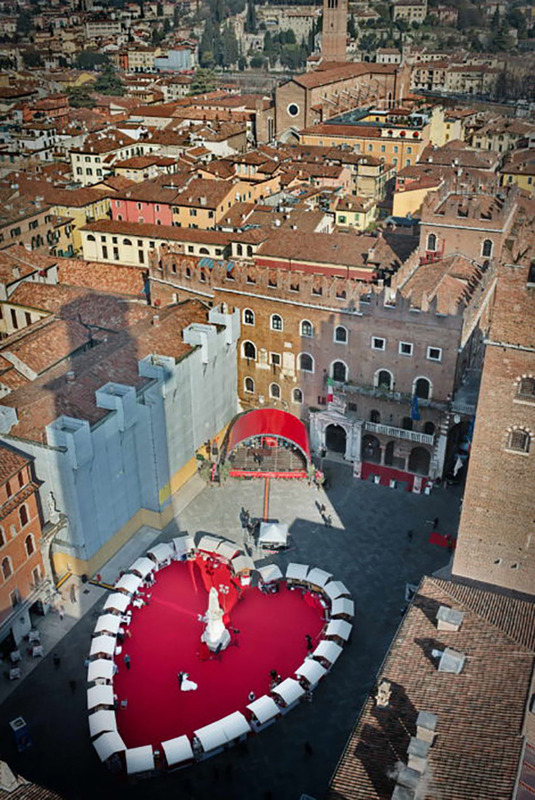 Precisely because of the quality and the facilities the city of Verona and its surrounding area has to offer, in proposing the city of Verona as a destination, "Fairytale Weddings" is certain of being able to ensure the same standards of quality, elegance and sophistication that it offers in every carefully selected location in Italy and around the world. In Verona you can get married in beautiful historic buildings where famous painters frescoed the walls and ceilings; in veritable museums where traces of the past are all around you; in old houses that belonged to the historic noble families of Verona, surrounded by olive groves and vineyards, as well as the last vestiges of the “family”. Dear friends, if you wish you can get married on the terrace of a glamorous hotel, with wonderful views of the city at sunset; in ancient castles oozing with history; in modern art galleries; in designer venues. If you prefer to get out of the city, you can say “I do” in old mansions with beautiful natural terraces overlooking Lake Garda or in beautiful gardens illuminated by the faint light of a thousand candles, or alternatively by the captivating light effects created by our Light Designer. As we’re sure you’ve understood, at "Fairytale Weddings" we make your dreams our dreams, then we go a step farther and turn them into a breathtaking reality, allowing you to discover hidden corners of the enchanting city of Verona and the surrounding area, accompanied by mouth-watering specialties all the way. The city center, where the visitor is immersed in the enchanting atmosphere of its streets and squares, has been awarded World Heritage Site status by UNESCO because of its urban structure and architecture. Verona is also the “Gateway to Italy”, because to those coming from the north, it gives a preview of the elegant nature, the beauties and the essence of our country. It’ll be our pleasure to take you on a fascinating journey that will lead you to discover the places that have made it famous all over the world. For all the romantics out there, we cannot fail to start this journey from Juliet's house and the balcony immortalized by William Shakespeare. This 13th-century building is located in the historic quarter where legend meets reality. The restored Medieval residence features a beautiful internal facade made of exposed brick, a Gothic entranceway, trefoil windows, a balustrade that connects the various sections of the house from the outside and, of course, the famous balcony. The interior contains furnishings from the sixteenth and seventeenth centuries and frescoes relating to episodes from Romeo and Juliet. In Verona history is in the very air you breathe and as you walk around you discover the marks left by the passage of every age and people, from the first settlements of the Neolithic era to the long history of friendship with Rome in the period of maximum splendor of the Holy Roman Empire. If you meander around the streets of Verona you can easily lose yourself among the Roman remains, or if you go up to the surrounding hills or along the river Adige you can peruse the remains of a Neolithic village. "Fairytale Weddings" will take you to places full of history and culture, places that will astound you, like the beautiful historic bridges criss-crossing the river Adige. It’s like being in an open-air museum, the perfect backdrop to your fairytale wedding. The bridges of Verona are highly impressive, passing over the Adige river that symbolically “embraces” the old town. The “Ponte Pietra”, once known as the Pons Marmoreus, is a Roman arch bridge spanning the river. It’s the oldest bridge in Verona and still links the Roman Theater to the city center. The Castel Vecchio or Scaliger Bridge is a fortified bridge on the other side of the city center. This segmental arch bridge boasted the world's largest span at the time of its construction. The Roman Amphitheatre, better known by the name of “Arena”, is, along with the story of the two lovers Romeo and Juliet, the symbol that makes Verona famous around the world. Built around the first century A.D., the Arena, like all amphitheaters, hosted gladiatorial combats and the ones performed within its walls were so famous that they attracted spectators from far beyond the city. It is still in use today and is internationally famous for the large-scale opera performances given there. It is one of the best-preserved ancient structures of its kind. “Piazza delle Erbe” was the site of the town’s forum during the time of the Roman Empire and is now the prestigious “parlor” of the city, where the Veronese people meet for aperitifs in the evening. On the northern side of the square you can find the Torre dei Lamberti, the Judges’ Hall and the frescoed Mazzanti buildings. The shortest side features the Baroque Palazzo Maffei, decorated by statues of Greek gods, and in front of it stands a white marble column, atop of which is St. Mark’s Lion, the symbol of the Republic of Venice. On the southern side is the beautiful crenellated House of the Merchants, also known as Domus Mercatorum. Guarding the square is the watchful eye of “Madonna Verona”, a beautiful Roman sculpture. It’s the symbolic representation of the city itself and is set on the square’s most ancient monument, the fountain, built in 1368 by Cansignorio della Scala using a Roman thermal bathtub in red marble. The majestic church of San Zeno Maggiore with its ancient cloister is one of the greatest examples of Romanesque architecture in Italy, built over the 4th-century shrine to Verona’s patron saint, St. Zeno. According to tradition, the crypt was the location for the marriage of Shakespeare's Romeo and Juliet. Legend also narrates that during the flood of the Adige in the year 589 A.D., the water stopped at the doorway of the ancient church so as to protect the burial site of Bishop Zeno. Piazza dei Signori and the Arche Scaligere were symbols of the administrative power of Verona; the piazza is surrounded by monumental buildings linked by porticoes and arcades. One of these leads to the Torre dei Lamberti, from which you can admire a splendid view of the old city. In a small square adjacent to Piazza dei Signori you can find the Santa Maria Antica Church, in whose courtyard the Arche Scaligere were erected. These form a striking mausoleum complex housing the remains of the noble family “Della Scala” and are an extraordinary example of Gothic architecture in Italy. Piazza Bra is the largest square in Verona – some claim that it’s even the largest in the country. The piazza is lined with numerous cafés and restaurants, and is dominated by the imposing mass of the Arena and embellished by several important historical buildings. Close to Piazza Bra you can admire Castelvecchio, a stunning example of a fortified castle built in the mid-14th-century, with spectacular interiors. In its day it provided the city of Verona with a fortress against any external dangers that could come across the Ponte Scaligero. It now houses a museum displaying works of medieval, Renaissance and modern painting and sculpture of great artistic importance.